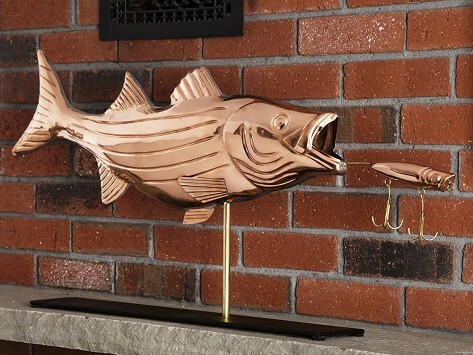 A copper weathervane sculpture is a classic way to make a house-proud statement, even indoors. Beginning with original sketches by American artists, each heirloom-quality weathervane sculpture mimics the traditional design in a version scaled for spaces inside, like a mantle or table top. Handcrafted in India with beautiful copper that will patina over time. Guaranteed to last a lifetime. Dimensions: Bass: 38" x 17" x 7"; Horse: 30" x 23" x 6"; Buck: 35" x 29" x 8"; Eagle: 30" x 23" x 7"
Weight: Bass: 18 lbs. ; Horse: 15 lbs. ; Buck: 21 lbs. ; Eagle: 20 lbs.